"I first saw Hélène's ring designs in a gallery on Granville Island, Vancouver and from there visited her studio. 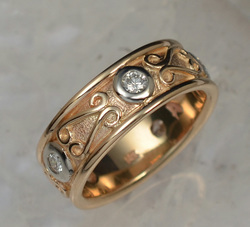 Her artistic talent and enthusiasm to produce a wedding band that I would like convinced me to have her create my ring. The finished product is unique, much admired and just fantastic." "I cherish and delight in owning some of Hélène's exquisite jewellery, reflecting her sensitivity and imagination.The entire process, from design to completion, was professional and awe-inspiring." 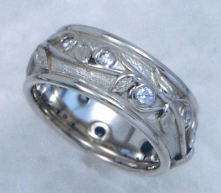 "Thank you so much for the very beautiful wedding rings you made for us. 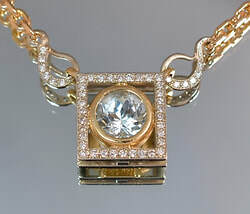 We love them both and treasure them for their symbolic meaning in our marriage as well as their beauty. We enjoyed working with you and really appreciate your enthusiasm and professionalism." It's a Monday night and Bruce and I are making dinner. Sounds like an ordinary thing to do, except my ring caught the light and I had to sit down to write you. I was saying to Bruce, "You know, my ring is just so much more than my wedding ring," and then, I needed to think about it. "I mean, it's so great. I love it so much." He stopped, said "Yeah, like little works of art that we get to wear every day." And, I can't even think how many times we've meant to write. So, here's to say thank you. Soul goes such a long way. Our family (members of 3 generations) have been marking major milestones, birthdays, weddings, engagements graduations with Hélène's works of art for the last 19 years. Her work is a precious symbol that holds important memories for us. We chose Hélène above any other designer because of her talent and palpable honesty, of course, but equally important, her warmth and genuine desire to create a piece that is personal and meaningful. Xaylan and I are so thrilled to be "sporting" your work on our fingers (ears, etc). I may even consider piercing my belly button! Xay's ring is perfect, you really have cultivated your gift of creating. I always find your work inspiring and almost magical. I am lucky to have met you! Thank you for your work." Thank you for such an amazing work of art- my ring. It is stunning and beautiful. I just love it. Each day I carefully take it from the ring box and put it on, admiring the design and the intricate details. I love the setting of the gem and the colour. Thank you for putting your energy and creativity into my precious ring. It will be my symbol of change and renewal." "P.S. I show it off any chance I get!" Thanks so much for making us such a beautiful engagement/wedding ring. We absolutely love it. I am constantly admiring it on my hand. You played a special role in making our engagement such a happy experience. Makers and designers: The artists know that each piece can be measured or weighed – traded and sold but the real soul of any work comes through the artist. Call it love or joy for the work but original art must have that ineffable quality being fashioned into each and every piece. That is where art starts and ends. Hélène Bourget has gotten it right and for many years. Her love for her work speaks beyond the carat or setting, texture and brilliance. Surely her ability also to work with clients to determine the right design to make each piece she completes individual and special is a remarkable skill in itself. Artists by definition today never expect nor likely will become rich but for many years Hélène has found her path in her distinctive jewelry – a path which takes our breath away. As clients for some of those years and owning several treasured pieces we love and appreciate her work and don’t hesitate to recommend to others to find their special work of art through Hélène’s studio. Please feel free to drop me a line about your experience.